– Removed the city ‘anchor’ icon and replaced it with a blue number indicating the number of city improvements. – Repairs cost iron. The iron cost is equivalent to the original iron cost (e.g. a ship at 50% damage will require 50% of the iron that it cost to build it originally). 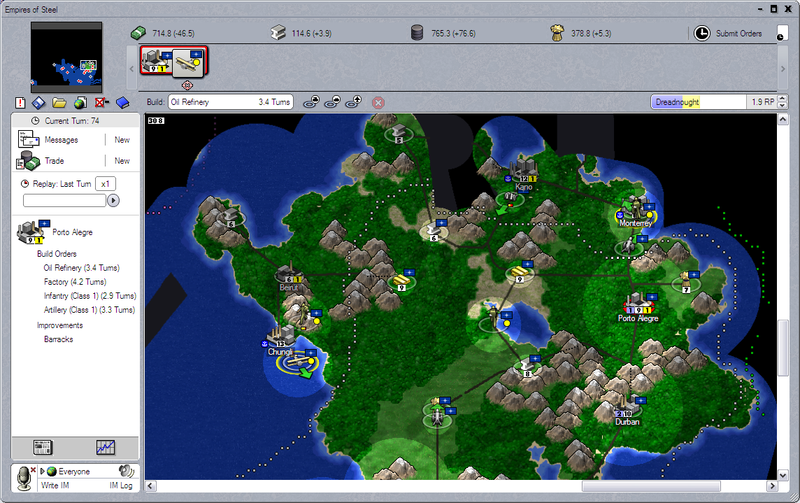 – The game-setup window now let’s players individually adjust land-density, cities, gold, iron, food, and oil abundance. – – This applies to random maps and custom maps/scenarios. – – Added the same feature to the map-editor’s random map generator tool. – Added warning popups that appear if you try to submit your turn and you’re about to have a resource shortage. – An upgrade order no longer turns-off ‘sentry’. – Fixed bug: The scenario editor forgets player restrictions if you edit the map-setup settings. – Added a page to the game-manual for the “Unit Description” window. – Fixed bug: National Summary information was wrong if you weren’t Player 1. – Thumbnail images on the ‘Downloads’ tab (inside ‘Updates and Downloads’). This isn’t fully functional yet, but you can see the Europe and Mediterranean thumbnails. – Fixed a crash that occurs when loading certain files. Error in a compression algorithm.